A fun plant for growing indoors or out during warm weather. The thick succulent stems grow in a zig-zag direction, back and forth between each leaf. The green and white variegated leaves take on a rosy blush in bright, sunny conditions. Devil's Backbone can be grown as a landscape plant in frost-free areas where it develops into a shrub from 6-8' (2-2.5m) and produces small red flowers. 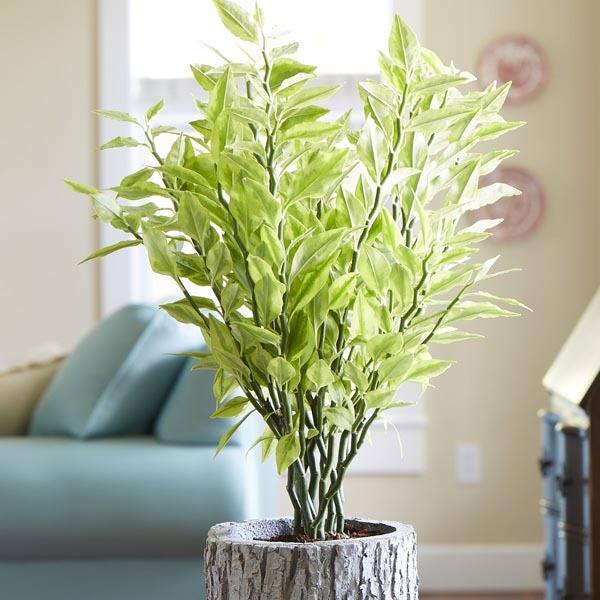 Plants grown indoors rarely bloom but are prized for their beautiful form and colorful foliage. A word of caution; all parts of this plant contain a milky sap that can irritate skin and may be harmful if eaten. Take care to locate the plant where it won't be in contact with children and pets. Wear garden gloves when pruning or transplanting to avoid possible skin irritation. Grow as a houseplant in any bright location. Makes a nice patio plant outdoors during warm weather. A useful landscape plant in frost-free climates. Apply a balanced liquid fertilizer monthly during active growth. Well-drained potting mix for cacti and succulents. Easy to grow. Provide a bright location indoors or a sunny to party shaded location outside. Requires well-drained soil and minimal watering, just once a week is usually adequate. Prune freely to maintain size and shape. Prepare the container by filling with potting soil up to 2” (5cm) from the rim of the planter. Remove the plant from its pot. Make a small hole in the soil slightly larger than the root ball either by hand or using a trowel. Insert the plant into the hole and press soil firmly around the roots and just covering the root ball. When all the plants are potted, water thoroughly to settle the soil and give plants a good start. Place plant in a reliably sunny location. Repot every 2 years in the same container or in a container slightly larger than the diameter of the roots. Prefers moist but well-drained soil. Check the soil moisture with your finger. If the top 2-4” (5-10cm) of soil is dry, or plants are wilted, it is time to water. Fertilizers are available in many forms: granulated, slow-release, liquid feeds, organic or synthetic. Determine which application method is best for the situation and select a product with a nutritional balance designed for foliage plants.